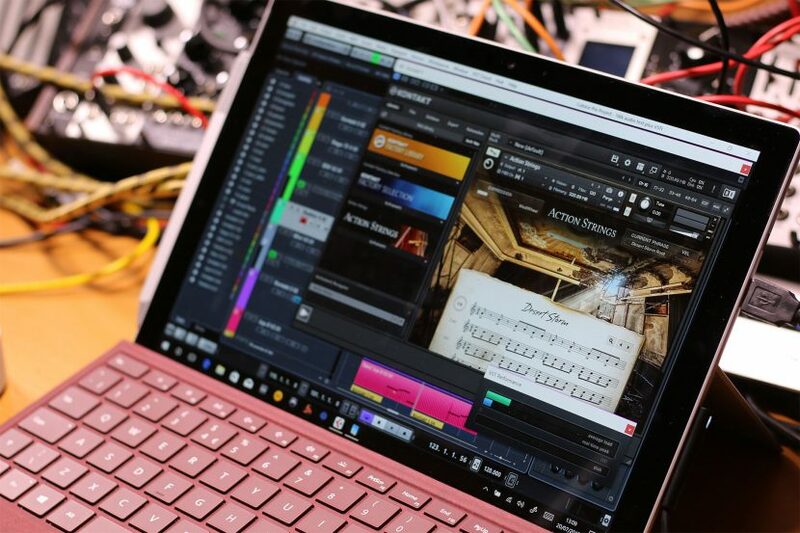 I’m currently in the middle of testing audio and music production performance on the Surface Pro 2017. It takes a long time to do so I wanted to update you on where I am and give you a sneak preview of the sort of results I’m getting. Full report coming soon! Just wanted to chime in and let you know how much I appreciate your efforts here. Outstanding research. I’ve gone from SP3 to SP4 (i7, 1TB, 16GB, tricked out) and I’m trying to decide whether to upgrade or not. A couple of questions … for maximum portability, I’ve been using the ‘internal’ audio and ASIO4ALL. Also, I’ve put everything on the SSD. Obviously, doing this for maximum portability but I hit performance glitches from time to time. If one of your videos (that I’ve watched and forgotten) outlines the ‘best way’ to set the SP4 up for optimum road warrior performance (dedicated audio interface?, placing VST instruments on external drive?, ‘settings’ tweaks?, etc. ), I’d love to hear your opinion. Finally, if there is some way to contribute $ to your research (if that’s appropriate), I’d certainly be willing to donate. I don’t see any problems with running everything on the internal drive. It should give you better performance than an external USB drive. ASIO4ALL can work well if you need it to – I always go with a USB audio interface myself. I have a video on tweaking – nothing specific about being portable because we want all the power all the time. Running on battery might have negative consequences. I hope to set up a Patreon page at some point. First question: I am thinking of buying a Dell XPS 13 with the new i7-8550U processor when it starts selling in a few weeks. On Cubase and Dell forums, I am having trouble finding anyone who is admitting to using Cubase 9 Pro (or any earlier version) on the XPS 13. Do you know anyone who is using Cubase on an existing Dell XPS 13 successfully? What kind of things should I look out for to make sure that it will run Cubase as well or better than a Surface Pro? Does getting someone to run latencymon help significantly? Second question: I use Cubase to edit classical piano music (currently on an iMac bootcamped to Windows 10). Either a single VST track with Ivory II Italian Grand or a mix of that piano track with a music minus one audio track. I don’t record in Cubase; I simply import a MIDI file from my digital piano.I may branch out into some chamber music with a VST violin track (Garritan orchestra 5 is what I have now). I may need some reverb, but I am not running dozens of plug-ins. Will an audio interface improve my set-up in any way, and if so, how (especially if I switch to a laptop)? Here’s the thing – it’s impossible to know if any given laptop is going to work well for music without trying it. On the whole everything should be fine within the limits of the system. But bad drivers and power saving technology can cause trouble. All you can do is try. Running Latencymon is a good start but it’s not the whole story. There are a lot of frustrated laptop owners out there. An audio interface will give you two things – proper, hard wearing and high quality physical inputs and outputs – and lower latency with better performance. If that’s helpful to you then get one, if not then don’t. I’ve been using Cubase Pro 9.5 with an XPS 13 9360. My only reference for performance comparison is my older Gigabyte P34G ( i7-4700HQ) which is over 3 years old. I find that with AD2 and about 12+ waves plugins the XPS CPU reading maxes out and starts to fall down, whereas the exact same project on the P34 shows the CPU usage hovering around the halfway mark. I’ve played around with Cubase’ various audio boost/ ASIO settings, but they make a nominal difference. It seems that the CPU speed difference between 1.80GHz on the XPS and 2.40GHz on the Gigabyte is making a big difference. The issue with Cubase not being able to take advantage of hyperthreading and overclocking is what may make those speed differences so important. Sorry that my observations are very unscientific, but I posted what I’ve experienced on the off-chance that it’s helpful to you. My outboard interface is an RME babyface, but i see very little difference in performance when mixing using the RME or the internal audio card. I know the Cubase/ hyperthreading issue is an extensive one, but I’m not hypertechnical enough to go into it all. I’ve been trying to test Studio One Prime with just a single MIDI input to control samples and record. I get a tremendous amount of latency, is this something you’ve found to be true as well? I know on my Mac I get effectively zero — but surface, out of the box, completely unusable without ALSO farting around a separate audio interface just to handle the playback? Yes that’s right, you do have to work a little but harder to get low latency in Windows. As Windows has to run on a thousand different configurations they have to build in a buffer to ensure that every system, no matter how crappy the audio engine, runs perfectly for playing back music/video/games. On Apple – they have one configuration, so the drivers are tighter. However, we can get around all that using ASIO4ALL on the on-board drivers or getting a decent USB audio interface. I talk about it all in my video on running Cubase Pro 9.5 on the Surface – https://youtu.be/-c6UajZLBW4?t=1446 – that should sort you out.